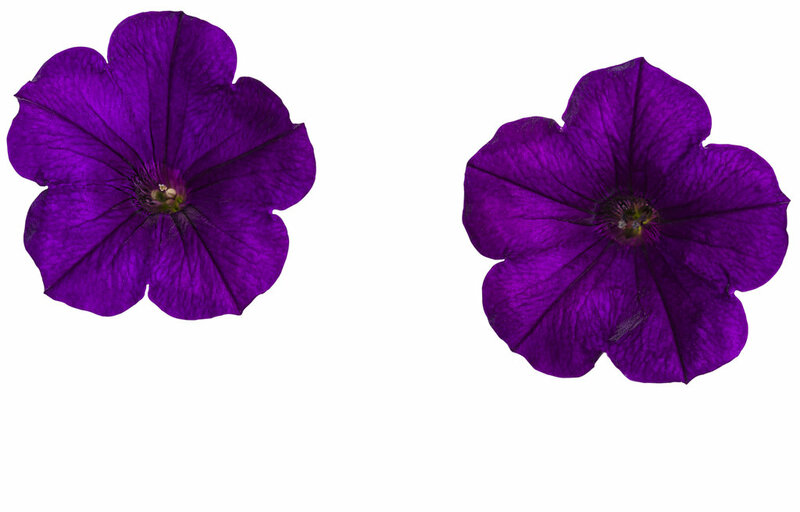 The Best Petunia. Period.®Not to brag or anything, but purple has been the royal color since the Phoenicians. You know, back in the Jurassic Period. 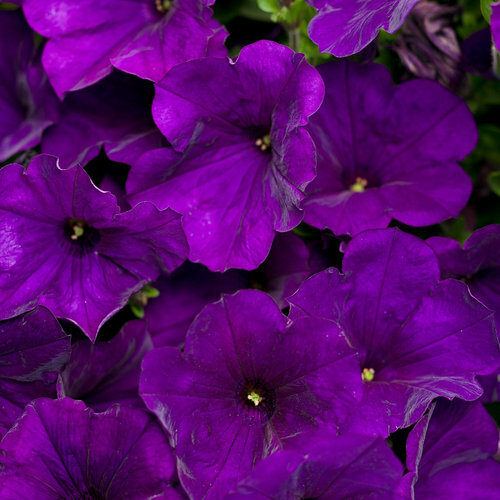 You wont find flowers anywhere that are a deeper, darker or more velvety purple-blue than mine. 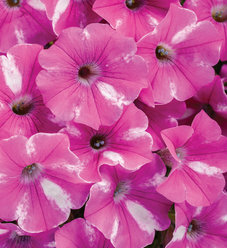 Since Im also a Supertunia (the Queen of Petunias) its a given that I bloom from spring until a hard frost. 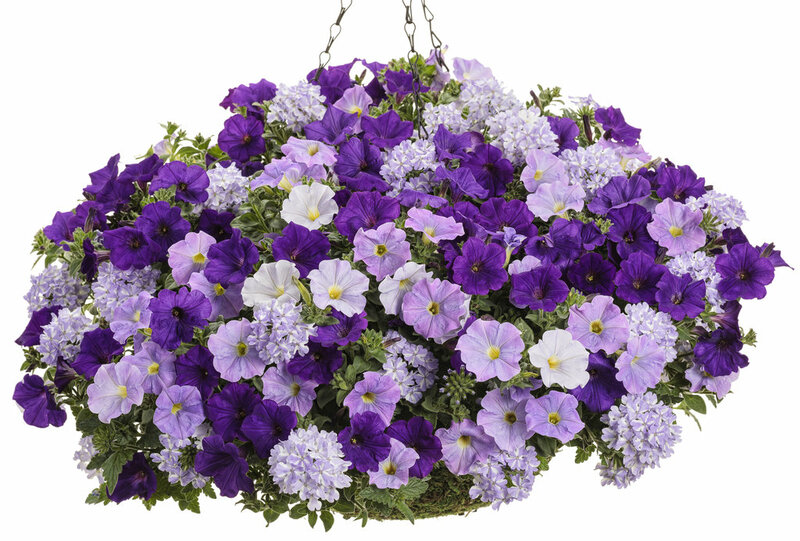 Not to brag or anything, but purple has been the royal color since the Phoenicians. You know, back in the Jurassic Period. 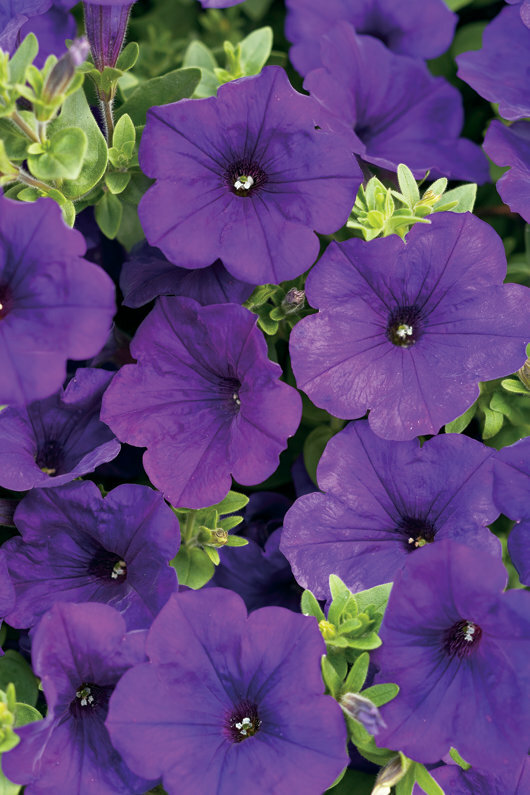 You won't find flowers anywhere that are a deeper, darker or more velvety purple-blue than mine. 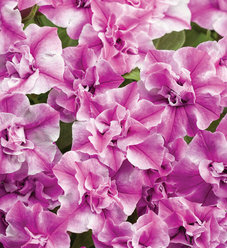 Since I'm also a Supertunia (the Queen of Petunias) it's a given that I bloom from spring until a hard frost. As in a gushing geyser of flowers. I also have a queenly scent that's especially noble in late afternoon and early evening. 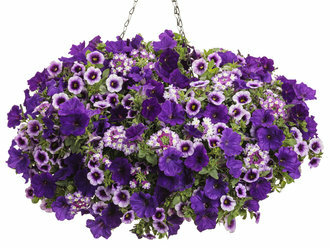 To show off my trailing habit use me in hanging baskets, containers or beds. As for colors, combine me with just about any--red, orange, white, pink, light blue, yellow, you name it. 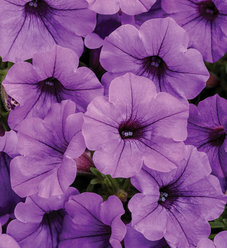 Being a nonstop producer of large purple Petunias is labor-intensive (no pun intended) so please feed me once a week with an all-purpose liquid fertilizer. In return, I promise to attract hummingbirds and butterflies, shed old blooms so you don't have to deadhead, and tolerate dry conditions. I have been growing Royal Velvet , I believe, since it was first offered. While the deep blue color is outstanding, my experience over the years has been that the flower size has decreased. 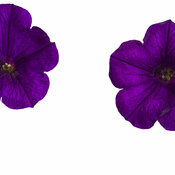 Even with regular feeding, by the end of the summer the flower size decreases in size, compared to the other colors. i.e Magenta, Bermuda, Bordeaux. 3rd consecutive year I grabbed one of these. 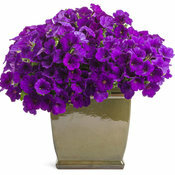 Every year the same result - vigorous growth, excessive blooms, intense color and durability. All I have to do is water, fertilize and pluck an occasional spent bloom. 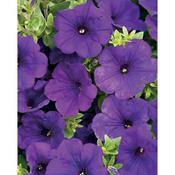 This petunia plays well with others as I have it in a large pot with 4 other plants. Could overtake the pot w/o a trim though. 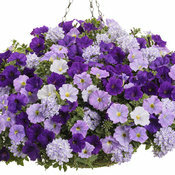 More than most other petunias (even other PW varieties) Royal Velvet has strong, firm branches and has so far held up well in the midst of 30-40 MPH winds. 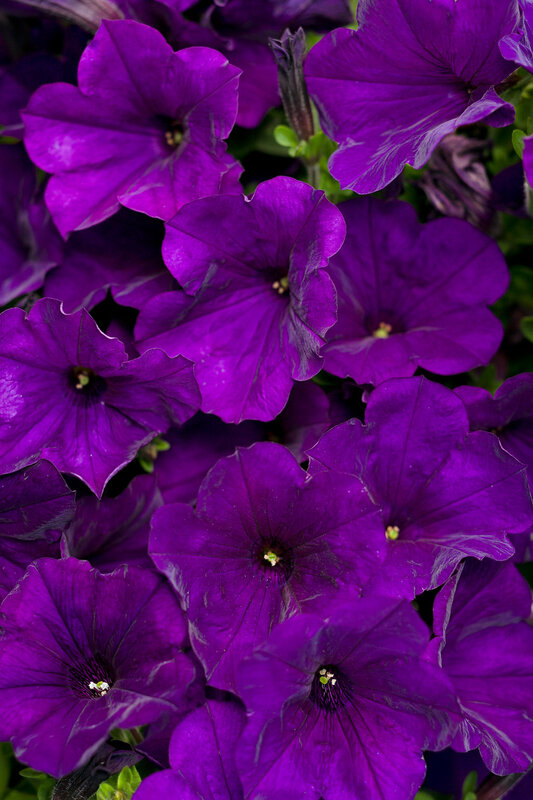 Would highly recommend and suggest it be placed with yellows, whites and pinks to further highlight the deep purple of this variety. I know it will bloom through September and well into October. 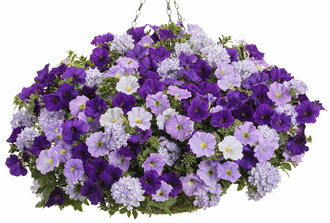 We bought PW hanging basket of petunia from Home depot. It was expensive but beautiful. It lasted very long. 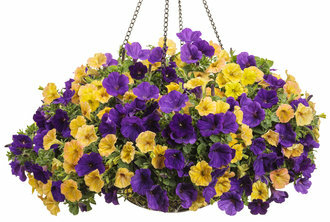 Grows, more blooms than any color used before! Flowers first appear dark and fade to a lighter color that is very nice, preventing the faded "I'm almost dead" dried look. I completely recommend this winner. I mass planted 98 plants in a shallow flower bed, approx. 50 sq. ft., in nursery mix soil, with water retaining crystals, water very other day unless over 95º, then daily, adding fertilizer weekly (I use Agloflash®). FULL SUN location. Results are by July 4th a solid wave of flowers overflowing the curb and climbing at the back. 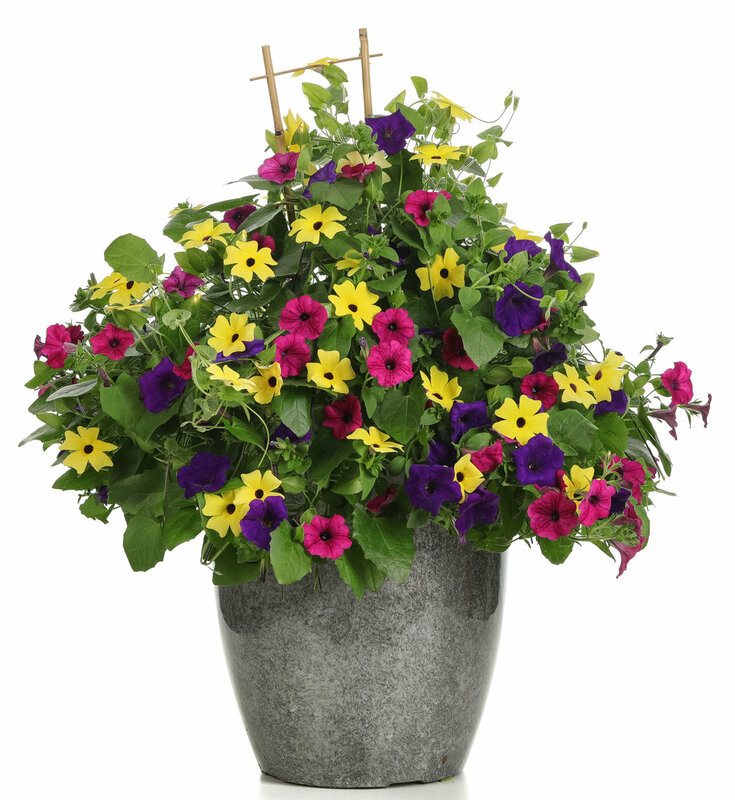 No deadheading and looks amazing without dead flowers visible! A sea of very elegant, royal color. *In fall just roll the plants like a sleeping bag starting at one end, folding the sides in ward as you go, and pulling each root ball adding it to the roll. Cut loose, when the roll is to the size you want, before it becomes to big and heavy to lift away for removal. Then prep. soil removing lost roots with a rake before fall planting or covering with mulch for a winters rest. I get two giant rolls (98 plants) that will fill a 6' pick-up bed and require 2+ people to lift over on to a tarp and up into the truck to go to mulching heaven, four smaller rolls would be big guy size, 6 rolls would work for one person.